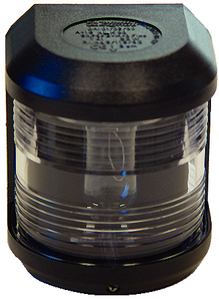 USCG approved for vessels up to 65'. 2 nautical mile visibility. Non-magnetic and saltwater resistant. Black housing. Bulb included. Fasteners not included. Size: 3.6"W x 3.2"D x 4.1"H.